The envisioning and creation of the Labyrinth at Emmanuel was very much a community effort. Please take a few moments to enjoy this video, created by Carl Buttke. 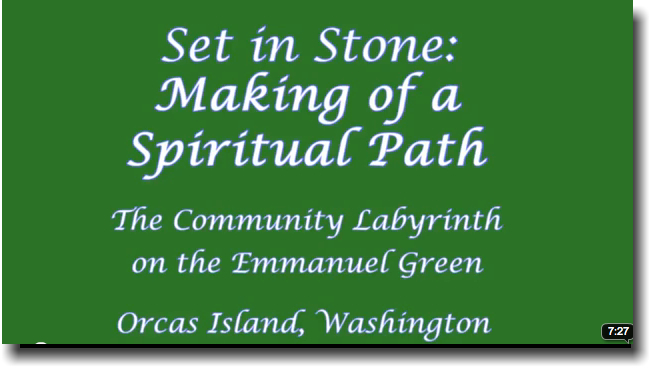 The building of the Community Labyrinth on the Emmanuel Green at Emmanuel Episcopal Parish, Orcas Island, Eastsound, Washington. The Labyrinth is seven circuit modified from the labyrinth in Chartres. It is 38 feet in diameter and made of Pennsylvania blue stone. Inspired by Nancy Ayer and the Community Labyrinth on the Emmanuel Green Committee, the Labyrinth was constructed during the fall of 2010 and winter of 2011 by Orcas Island Hot Rock Masonry and Kucklick Landscape & Design Service. Funding for the Labyrinth was provided by community donations and the Emmanuel Episcopal Parish.